Hello! A very quick one as I'm on 10% battery and its just gone midnight. I popped into town today to grab a cuppa with a friend. It's rather chilly and scary up here at the moment with flood sirens going off and very high winds, so I wrapped up pretty well. I've had this shirt dress from Fashion World for ages now and haven't got round to blogging it, I sized up to the 24 and got the tall option so it was oversized and could also be worn as a dress. 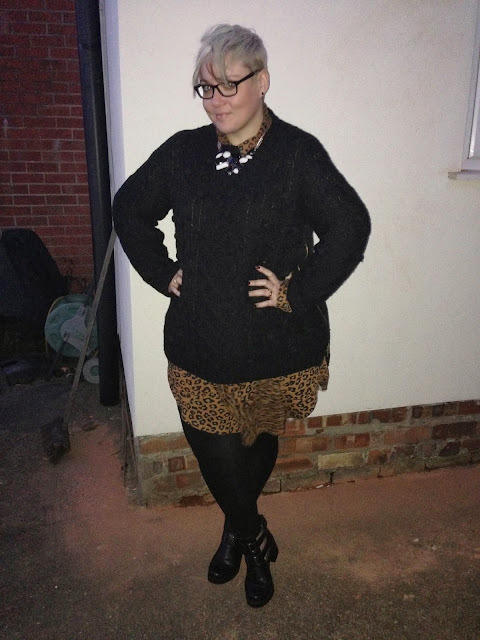 Today though I popped it on with leggings, and my favourite jumper of the moment from F&F clothing. Layering for the win!! Windswept and interesting! And please excuse the building site chic! As it stands at the moment, we haven't been hit too badly by the floods, but we'll have to see what the 5am tide brings! Wishing you all a dry couple of days!!! Fabulous outfit combo, as always! Hope the flood situation was ok near you?